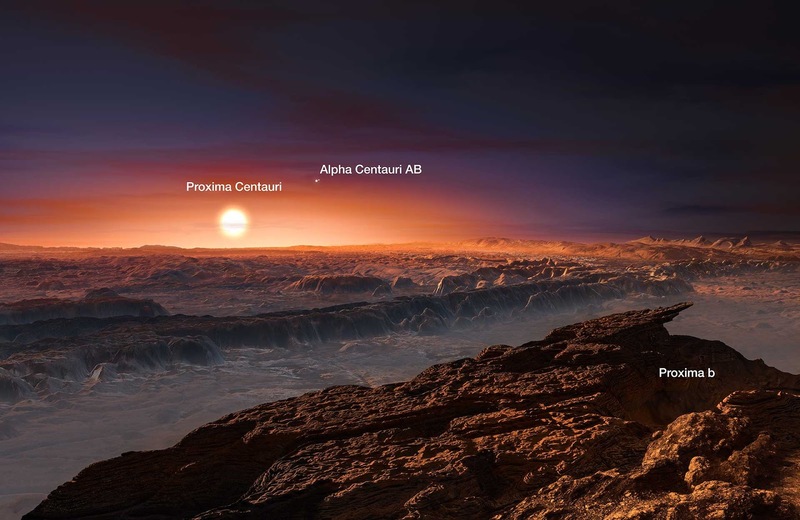 Proxima Centauri b (also called Proxima b) is an exoplanet orbiting within the habitable zone of the red dwarf star Proxima Centauri, the closest star to the Sun. "The planet could be an 'ocean planet', with an ocean covering its entire surface, and similar water to some icy moons around Jupiter or Saturn," the team reports. Proxima b was discovered this August orbiting the star Proxima Centauri, 4.2 light years away from Earth. The planet is around 1.3 times the size of Earth, but orbits at a distance of 4.6 million miles from its sun, a tenth of the distance that our own Solar System’s Mercury orbits at from our Sun. The exoplanet's star is about 12 percent the mass of our own Sun, and much dimmer. Hence, the habitable zone is shifted towards the star, meaning Proxima b could be nestled right where liquid water—and life—could propagate. 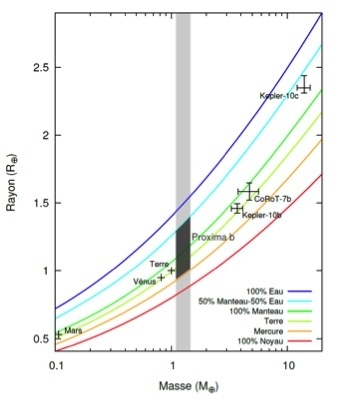 A mass-radius diagram comparing the positions of several exoplanets, including Proxima b. 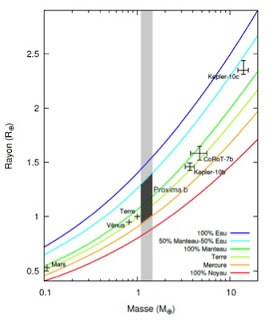 The grey box showing Proxima b takes into account the uncertainty of its mass and composition. At a maximum radius of 8,920 kilometers, the team said that Proxima b’s mass would be evenly split between a rocky center and a surrounding ocean, some 200 kilometers deep. "In both cases, a thin, gassy atmosphere could surround the planet, like on Earth, rendering Proxima b potentially habitable," the scientists concluded. Scientists suggested that the planet would be too hot for liquid water, as its distance from Proxima Centauri would leave its oceans “tidally locked” and facing the star—left to heat up to uninhabitable temperatures or even boil off. But the researchers at CNRS have rebutted that idea, for now. "Contrary to what one might expect, such proximity does not necessarily mean that Proxima b's surface is too hot for water to exist in liquid form,” said the research team in a statement.